LONDON: The prospect of Donald Trump winning the US presidency represents a global threat on a par with jihadist militancy destabilising the world economy, according to British research group EIU. In the latest version of its Global Risk assessment, the Economist Intelligence Unit ranked victory for the Republican front-runner at 12 on an index where the current top threat is a Chinese economic “hard landing” rated 20. Justifying the threat level, the EIU highlighted the tycoon’s alienation towards China as well as his comments on Islamist extremism, saying a proposal to stop Muslims from entering the United States would be a “potent recruitment tool for jihadi groups”. It also raised the spectre of a trade war under a Trump presidency and pointed out that his policies “tend to be prone to constant revision”. “He has been exceptionally hostile towards free trade, including notably NAFTA (the North American Free Trade Agreement), and has repeatedly labelled China as a ‘currency manipulator’.” it said. By comparison it gave a possible armed clash in the South China Sea an eight — the same as the threat posed by Britain leaving the European Union — and ranked an emerging market debt crisis at 16. “There are risks to this forecast, especially in the event of a terrorist attack on US soil or a sudden economic downturn,” it added. 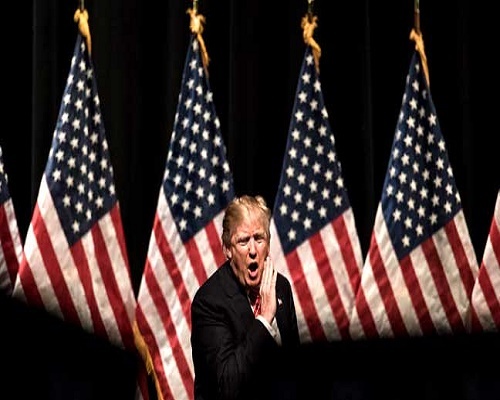 However, the organisation said it did not expect Trump to defeat his most likely Democratic opponent, Hillary Clinton, in an election and pointed out that Congress would likely block some of his more radical proposals if he won November’s election. Rated at 12 alongside the prospect of a Trump presidency was the threat of Islamic State, which the EIU said risked ending a five-year bull run on US and European stock markets if terrorist attacks escalated. The break-up of the eurozone following a Greek exit from the bloc was rated 15, while the prospect of a new “cold war” fuelled by Russian interventions in Ukraine and Syria was put at 16.